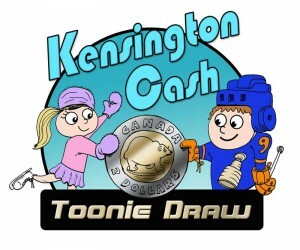 The Kensington Credit Union Centre is excited to offer a major fundraising effort called the Kensington Cash Toonie Draw. Funds generated are used to support the Credit Union Centre, the Kensington Minor Hockey Association and the Kensington Figure Skating Club. There is no cost to join and week is $2.00 to sign in. Draws take place every Thursday; participants must be signed in by Wednesday at noon or until 4:00 pm at the Kensington Fitplex to be eligible to win. If the draw is not won in any week, the prize pot carries over to the following week’s draw. Participants can only join the week after the prize has been won. For more information, call 902-836-3509. Winners will be announced and published on the Credit Union Centre Facebook Page.